My favourite performance photo – when I dared step on stage with David Moyse (ex Air Supply, current Hillsong) and ‘Dr. Bob’, Jeff Crabtree. Squee. Herewith, a rundown of my contributions to the musical arts, at least as far as they are represented on the interwebs. Wrong Side Of The Bed was recorded at Festival Studios in Sydney as part of the prize from a Channel 9 Battle Of The Bands competition. Member of Campbelltown Theatre Group between 1986-1988 – performed in Hello Dolly and Grease, and was backstage for Carousel and Wait Until Dark. Currently looking for an opportunity to play my newly-acquired saxomophone. 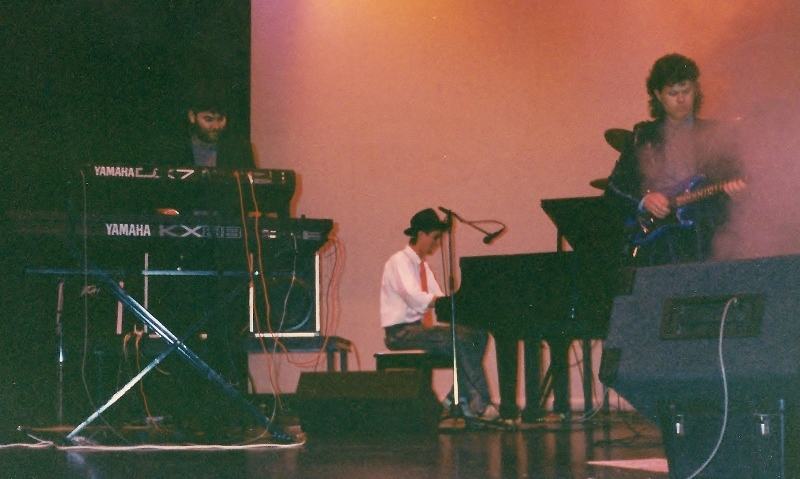 I and the youth group at Warwick Church of Christ wrote and performed a musical called the One Place in 1992. Few records have survived. Received a few APRA cheques for writing the theme tune for ‘Solid Rock’, a Music Video show on Channel 7 between 1993 and 1995. I love my Yamaha Motif 6 keyboard, which I plug into GarageBand on my iPad 2 and iPhone when I’m able. I have sites at ReverbNation, SoundCloud and Bandcamp which are a little light-on right now. Stay tuned.